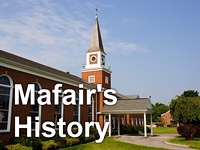 We will begin a DISCIPLE Bible Study at Mafair in September. The tentative schedule will be orientation session on Monday September 8th with the study to begin the following Monday evening. DISCIPLE is a long-term, in-depth Bible Study for persons who are seeking to grow in their Christian walk. Information on DISCIPLE Bible Study can be found by clicking here. Because of the expanded format of DISCIPLE, the offering will be on Monday evenings rather than as a part of Wednesday evening programming. The plan right now is to study “Jesus In the Gospels” which is a 30 week study. Enrollment will be limited to 15 persons and each person will be responsible for the cost of his/her workbook. Please contact me for further information, or send me an email if you want to participate.